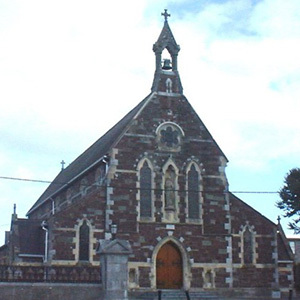 The foundation stone of the present Catholic Church, St. MARY’S, was laid on the 4th of November 1869, the architect was George Coppinger Ashlin and the church was built from local sandstone by Newstead Builders of Fermoy, at a cost of £2,500. The church was opened and consecrated on 15th. of May 1872. Over the doorway, leading to the nave is the inscription “Do Dhia foai Thearmuin Muire Naomhtha”. The tablet bearing this inscription must have come from the earlier church which must have been on or near the same site. This earlier church had been designed by the well-known Fr. Matt Horgan, while he was curate in Carrigtwohill. 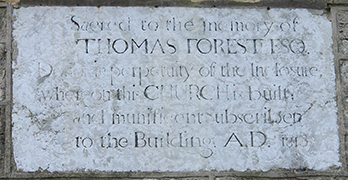 A stone on the outside of the east wall of the present church, directly over the High Altar commemorates the memory of Thomas Forrest Esq., donor in perpetuity of the enclosure in which this church is built and is dated 1816. This was taken, evidently, from the old church on the same site which would have been built in or about 1812. He also noted that there were three or four free schools in the parish. Windele, who was at Mass in Carrigtwohill on Palm Sunday, 1833, described the people as bringing each one his own branch of palm and holding it up in his hand to be blessed. Bishop Keane (1860) noted that the chapel badly needed a sacristy and dressing up. By 1864 a new sacristy had been added. The old National School for boys and girls on the Barryscourt road was built in 1856. A National School had existed for some time when the Sisters of the Poor Servants of the Mother of God arrived in 1875. The Order was invited to establish a foundation in Carrigtwohill by Miss Fitzgerald of Rockville with the support of Father Seymour. He promised a site for the Convent, a subscription towards the building costs and “the grass for a cow” – in what was to become the GAA ﬁeld. Within a short time the Sisters had taken over the teaching duties for girls at the National School. By the 1890s they had opened a secondary boarding school. In 1969, the Very Rev. J. Canon Ahern, did some renovating in the interior of the church. These renovations were carried out by Ellis and Co. The altar and sanctuary were adjusted to Vatican II requirements. A block floor replaced the old slab floor. The whole church was re-wired and painted.